Two young women were crowned June 30 as part of the Miss West Virginia Pageant hosted at the Metropolitan Theatre in Morgantown, WV. Katelin Bocchetti, representing Jefferson County was named Miss West Virginia’s Outstanding Teen 2018. 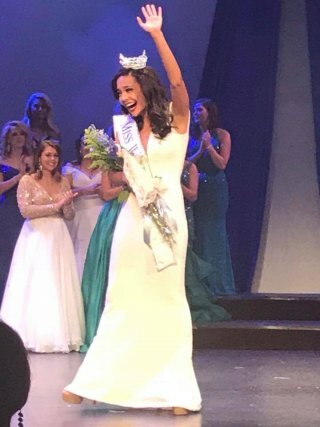 Madeline Collins, who represented the Elkins area, was named Miss West Virginia 2018. Katelin Bocchetti will represent West Virginia as she competes at the national Miss America’s Outstanding Teen pageant in August. Madeline Collins will represent West Virginia as she competes for the title of Miss America 2018. The national pageant will be broadcast live September 9th, 2018 on ABC. Collins received two preliminary awards during the first two nights of competition: swimsuit and talent. Bocchetti received a preliminary award for evening gown and onstage question. The Miss West Virginia Scholarship Organization hosted the annual Pageant June 28-30 at the Metropolitan Theatre in Morgantown, West Virginia . The Miss West Virginia Scholarship Organization hosts an annual competition at which a selection of the state’s most eligible leaders promote a platform they established.